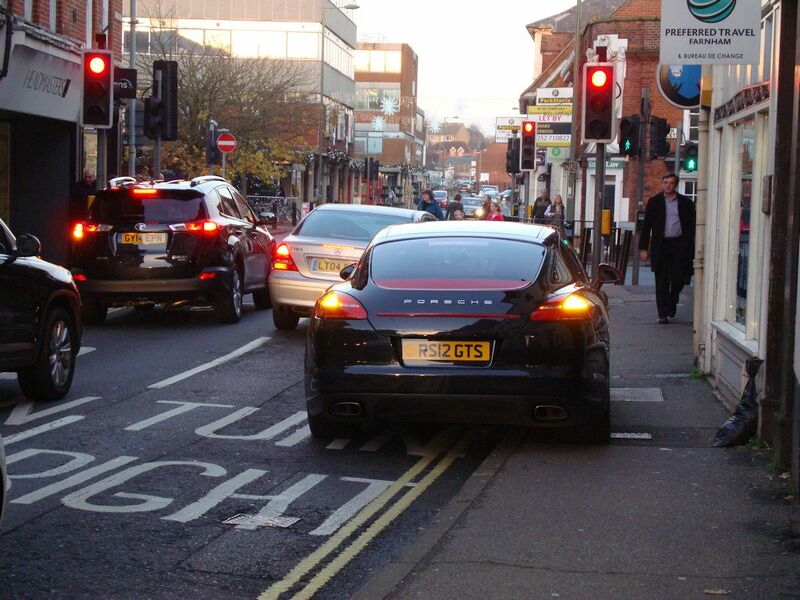 A cold afternoon in Farnham. I cut through the churchyard. It is freezing, noticeable colder than the street. No board outside the church, though lights on inside. A man walks out of the church. I ask is it open? A sore point. He is not happy that he has been thrown out of his own church by a bunch of percussionists. I say I will chance it. He wishes me luck. I walk in, no on says anything. Then when I take a picture, a woman ask me to leave, says someone might steal their percussion instruments. I cannot see how, when they are there. She is eating a takeaway, the smell permeating the church, another woman using her mobile. I have often in the summer wandered in during rehearsals, no one ever objects. I am careful not to disturb the rehearsal. I am always made welcome, invited to attend the concert. They will explain who they are, what the concert is. Not this rude woman, I am asked to leave. These though were musicians on tour. Obviously full of their own arrogant self-importance. I ignored the woman who has asked me to leave, made my way out at my own pace, stopping to write notes in the visitor book to say how appalled I was by their behaviour. 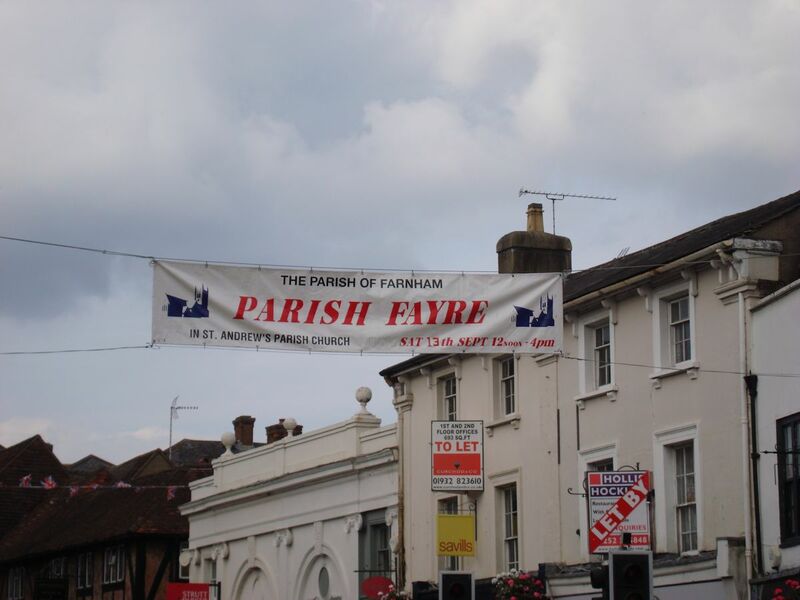 This incident raises important questions on the use of Farnham Parish Church. I am pleased that is is open, unlike most churches which are locked, I am pleased that it is put to use, I would not expect to walk in on a concert in the evening without paying, and if rehearsal, I take great care not to disturb, but I take great exception to being asked to leave, especially by people who were showing disrespect to the church and those who use it, but acting as though they owned it. I came across cellist Philip Higham rehearsing in Farnham Parish Church. He was very good, ideally suited to the church acoustics. I was tempted to buy a CD but at £20, no way. I left, returned, and bought. Had it been £10, I would have bought two. It was though a double CD. Philip Higham was quite apologetic. He has to buy them. That is the disadvantage of being on a record label. As the acoustics were so good, I suggested get hold of quality recording equipment, record, master and release as a live recording on bandcamp. If lack the funds, crowd source. Also consider looping the cello. I gave Zoe Keating as an example. Or could do a duo with bass player Steve Lawson. In the evening, was giving a cello concert hosted by Tilford Bach Society. Most church summer fetes are held in the summer. For whatever reason. Farnham Parish Church choose to hold theirs in the middle of September. Today was sadly a washout. The only stall outside was the sausage stall. But why call excellent sausages from the butcher in Downing Street hot dogs? The other stalls were inside. 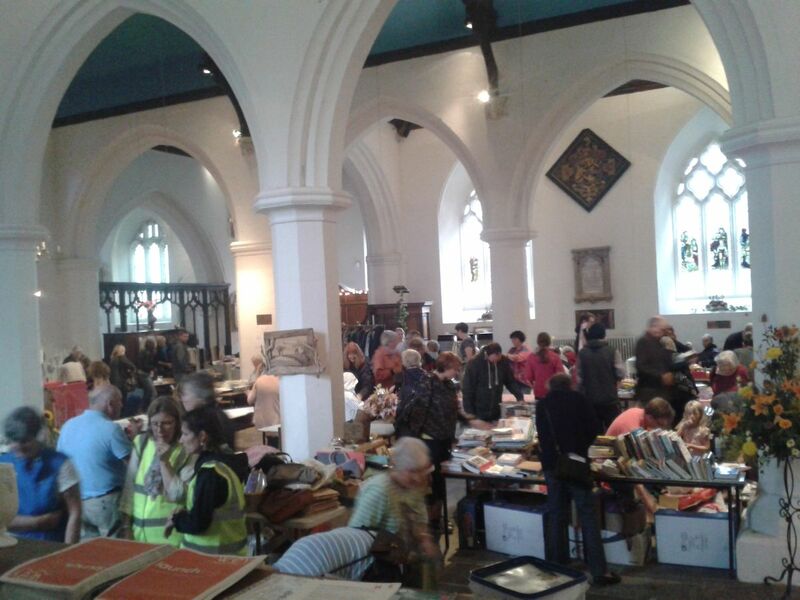 It gave the church the appearance of what a medieval church must have looked like, a market place. Too late for soup at Barista Lounge. I am sure if the girl serving had troubled to ask the kitchen, there probably was soup. Cappuccino and cookie in Caracoli. Cappuccino far better than what I had in Caracoli Guildford. But, Caracoli has an awful corporate feel, completely lacking in character. I am pleased to see they sell their bread off at half price towards the end of the day. Or at least buy one get one free. Half price would be better. Then after the shop had closed, some women came and took what was left. Who they were I do not know. A soup kitchen maybe? Better than Loaf, who fail to reduce, then throw their bread away. The only attraction of Caracoli Farnham is a highly skilled barista who knows a lot about coffee. But he departs soon for pastures new the other side of the world. Tax-dodging Starbucks packed. 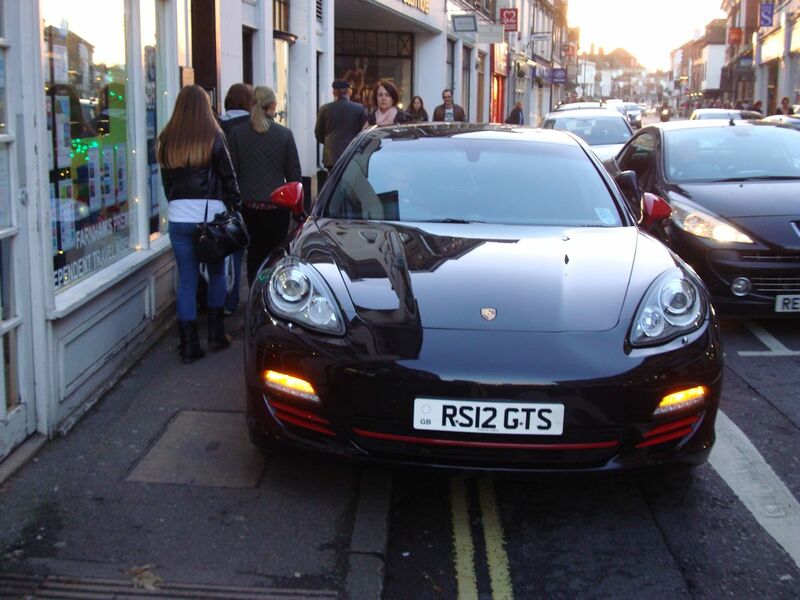 Do locals in Farnham have no social conscience or taste for coffee? 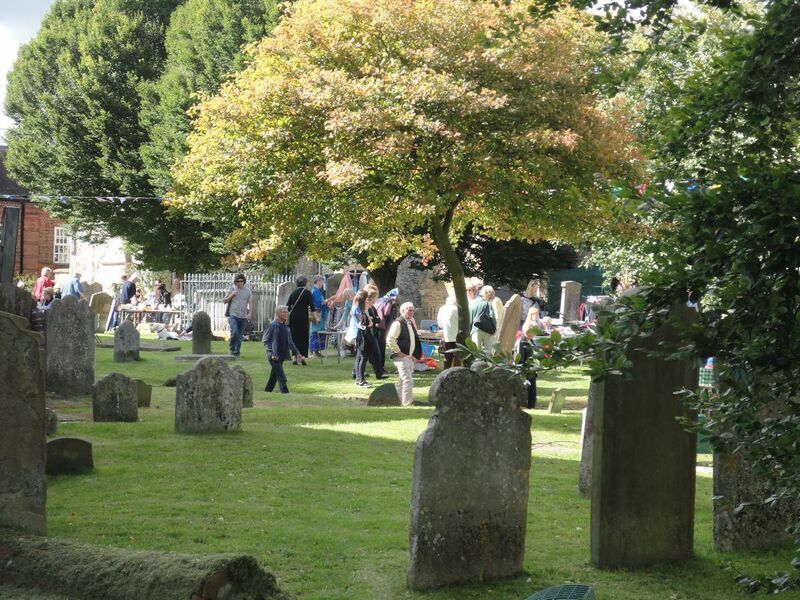 Along the River Wey, up through Gostrey Meadow into Downing Street, then into the churchyard. As I walked in, a teddy bear on a parachute came floating down from the church tower. The only one I saw. There did not seem to be many people or that many stalls. The usual rubbish, though may have been better had I arrived earlier. The book stall had a few good books. I picked up a copy of The Shack. No food left at the barbecue. On a previous occasion, lots left. Inside the church quiche and salad. Followed by cream tea. Though I was baffled why the jam and cream in little plastic pots. Appalling waste of money and bad for the environment. I am no great fan of FairTrade, but shocked to see the coffee Nescafe. Why does the church not invite the tea van I see in Gostrey Meadow (though not he last few weeks) and share the proceeds or charge a reasonable pitch fee? Similar with the ice cream, invite Dylan’s ice Cream. 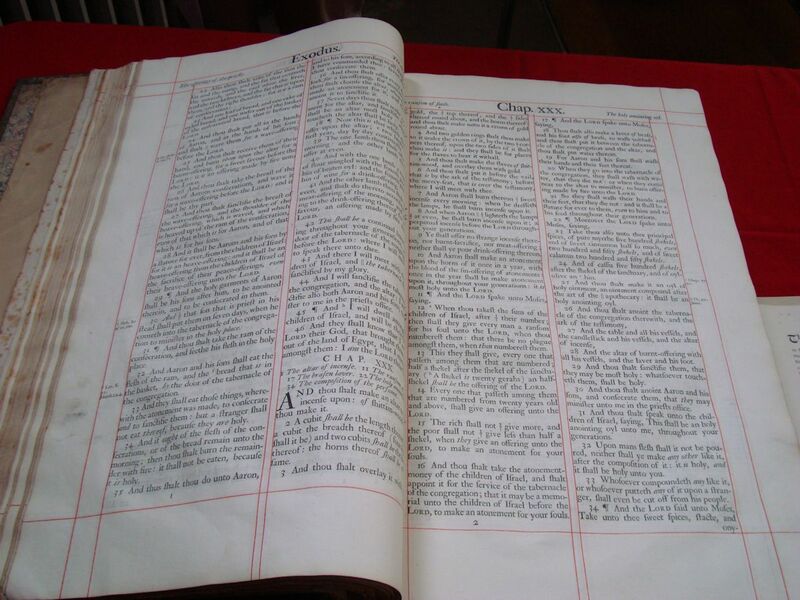 The church has a very rare Bible, rarely seen. Today was one of those rare occasions. Known as the Vinegar Bible, due to a misprint. The Parable of the Vineyard in the Gospel of Luke has become The Parable of the Vinegar. I then realised four o’clock, I would be lucky to catch the butcher. Luckily I did. Sadly he has not ordered copies of Flatpack Democracy. Asked would I? I agreed yes. I popped in the piano shop in Downing Street and let the lady know about the programme on BBC Radio 4 on Steinway (broadcast Thursday evening rebroadcast Sunday evening). A walk around Bishop’s Meadow, into the field with the horses, then back via Manor Field. A patch fenced off. No notice explaining why. 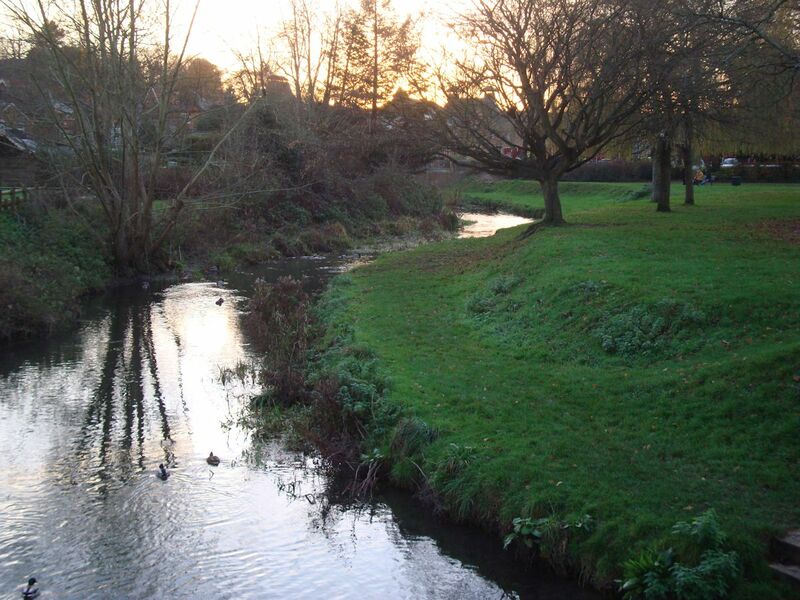 It is vital Bishop’s Meadow Trust keep people informed, as that is how you continue with public support. Waitrose fortunately not too busy. First hard frost of the winter this morning. In the shade frost remained all day. Walking by the River Wey, frost on the banks. Rehearsals in Farnham Parish Church by Waverley Singers for a Christmas concert this evening. Last week Vivaldi Singers, this week The Waverley Singers. A large poster for Will Todd. The choir were singing two of his pieces. 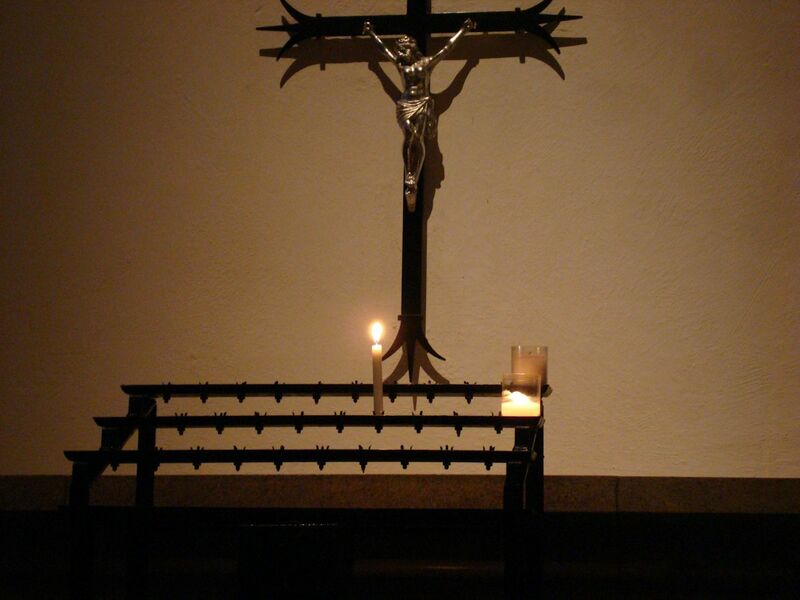 He was not around, maybe this evening, I was told. A pity, as I may have bought his latest album Lux Et Veritas. Will Todd was commissioned by The Waverley Singers to write The Mind That Lives to mark celebrate the 250th anniversary of the birth of William Cobbett, who lived in a farmhouse, now The William Cobbett pub. But do not get over excited, it is all of eight minutes long. It is strange, you do not think of an amateur choir commissioning a work, you think of the composer sitting down and composing. Traditionally that is how the system worked. Raises interesting questions on copyright: Who owns the work? Or is it placed in the public domain? Can anyone perform, do they have pay a fee, if so, who to? Website of Will Todd is a classic of how not to, big record label outmoded thinking stamped all over it. Snippets of videos, lofi mp3 samples. This does absolutely no justice to the works of Will Todd and is an insult to those who may like and wish to listen to his music. He is not doing himself any favours. Put entire live recordings on youtube or vimeo, upload all albums to bandcamp. Then can embed on his website, people who go to a concert can share. A candle lit. And yes, there were candles. On my way out, a poster in the porch for an album release by a singer-songwriter I know. I do not recall seeing the notice last week. It was for a concert yesterday. 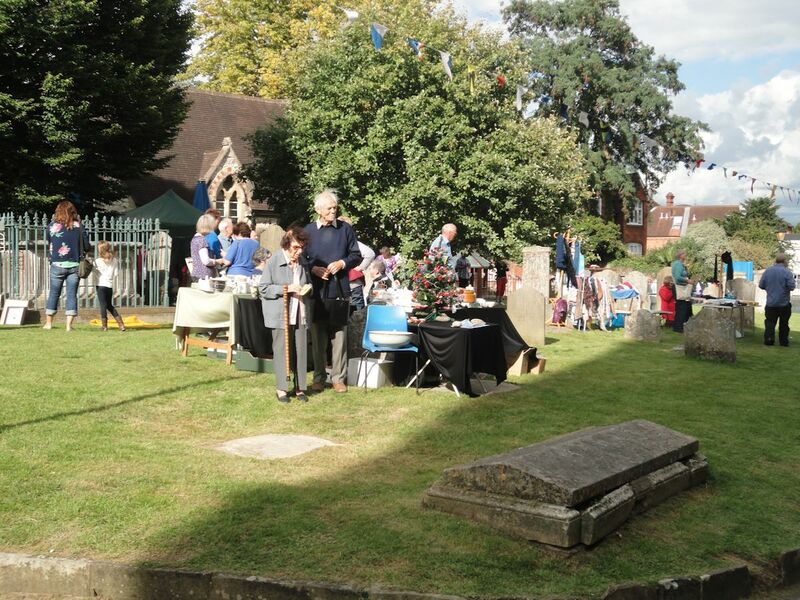 I tend to forget, it is worth visiting Farnham Parish church as useful location for what’s on in Farnham. I thought service in Waitrose could not possibly be worse than last week. Sadly they once again prove me wrong. 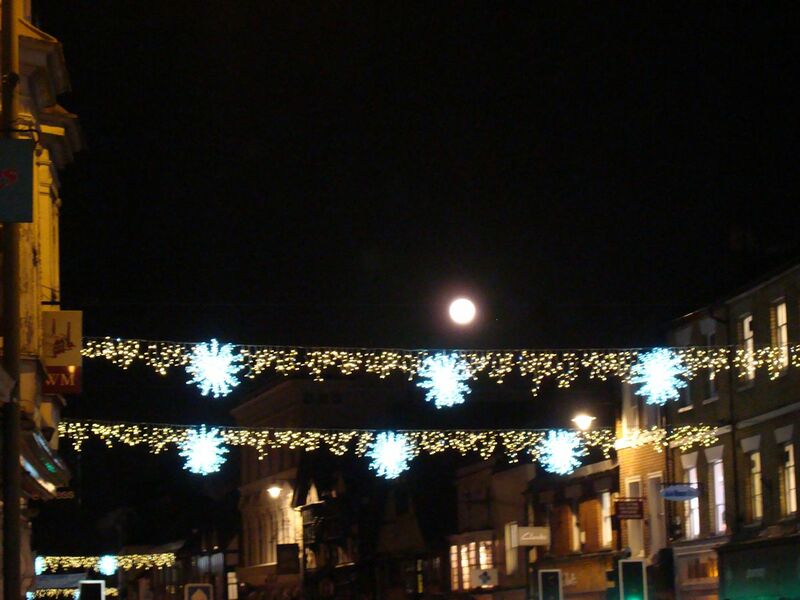 Walking along The Borough, wonderful juxtaposition of full moon and Christmas lights. On show in Farnham Parish Church during their church fête their Vinegar Bible, the first time, I was told, in twenty years. So called because of the misprint of Vinegar for Vineyard though it could equally have been a mistranslation. 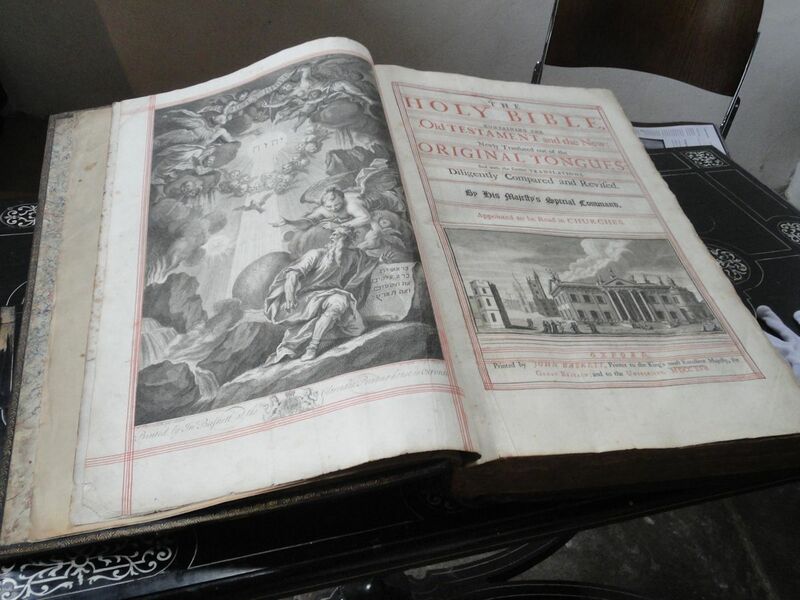 This is a King James Bible printed by John Baskett in Oxford in 1717. The copy held by Farnham Parish Church has been spilt and rebound as two volumes. This is one of only twelve known copies. 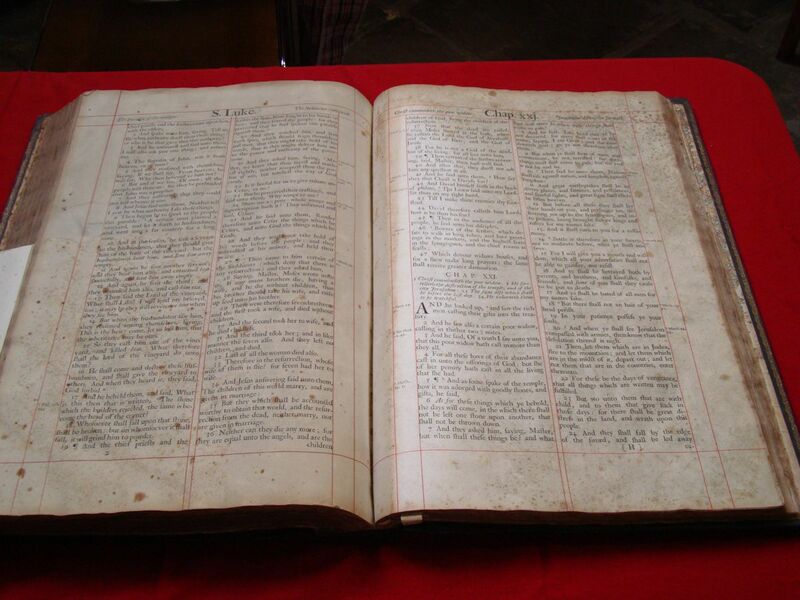 The Vinegar Bible was presented to Farnham in 1739 by Arthur Onslow, speaker of the House of Commons from 1727 to 1761. John Baskett was printer to King George II and to the University of Oxford between 1711 until his death in 1742. He was responsible for printing many fine books. However his name is remembered above all for his 1717 printing of the King James’ Bible. His edition, which contains many neo-classical engravings by James Thornhill and Michael van der Gucht, should have been one of the highlights of his career, but so many printing mistakes were made that people referred to his Bible as a “Baskett-ful of errors”. 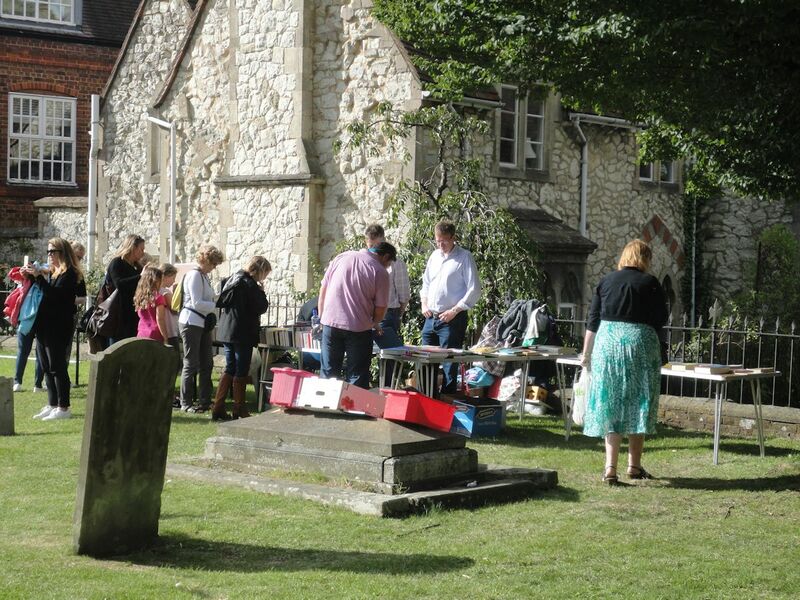 A surreal atmosphere, stalls scattered amidst the graves and tombstones and teddy bears parachuting off the church tower. The stalls were as I expected, junk. I had a couple of sausages off the barbecue, though why call them hot dogs, these were quality sausages off the local butcher in Downing Street. A pint of real ale off the beer stall, though half would have been ok. I then wandered into the church where cream teas were on offer. 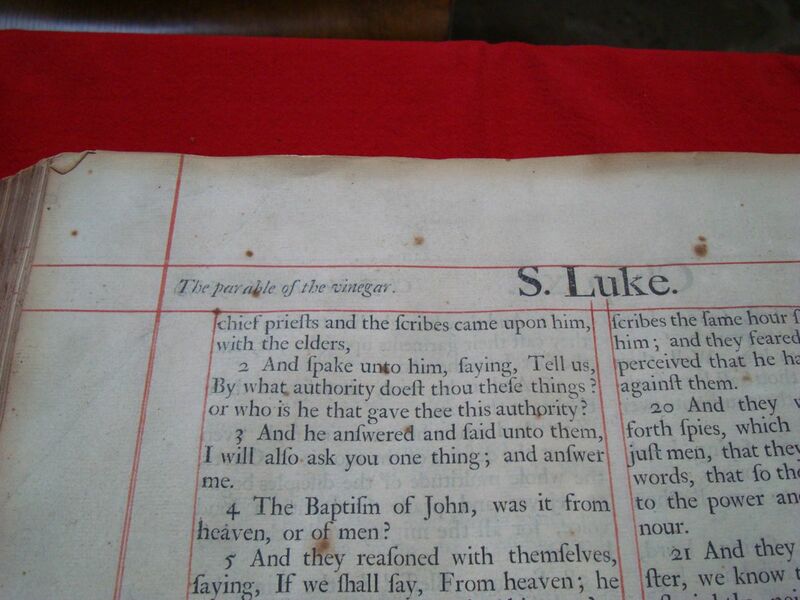 But first, I had a look at a very old Bible I had never seen before. An extremely rude woman wanted to know why I was taking photos. I could have told her to mind her own business, but instead told her I was not using flash (thus not damaging the extremely rare Bible). The point seemed to be lost on her. I then asked why she was asking and who was she? She said she did not like being interrogated and stormed off. In truth I think, when it became apparent I knew how to handle old documents. I asked the lady who was guardian of the Bible, who was the rude woman? She said she did not know, and had been rude to this lady too. She said she was nothing to do with the church. At first I assumed, maybe the Bible was on loan from the local museum, possibly a curator, but apparently not. The Bible had at some point in the past, been split into two volumes. One volume was in quite poor condition. Sadly, it is stored in a damp old box. By no means ideal. I wandered back to the cream teas, to find it was four o’clock, and everything packed away. It is crazy, a lovely warm sunny afternoon, plenty of folk around, and yet on the dot of four o’clock, everything gets packed away. Many were packing up not long gone three o’clock. I had a chat with the Music Director. He liked the idea of Jewelia giving an informal concert. I then realised, I had to go to Downing Street to the local butcher. I feared I would find closed, but luckily not. As it was a lovely afternoon, I then went for a long walk around the 23-acre Bishop’s Meadow.